A Safety Fence Adds Style And Safety! Does your home have a pool? If so, does your home have a pool safety fence? Safety fences are a necessity for any pool owner, in order to protect children and animals from harm, and yourself from liability. At Ware Fencing, we offer fast and affordable pool safety fence installation in Crowley and Fort Worth, TX and the surrounding areas. If you’re interested in learning more about how we can make your home and pool a safer place, give us a call at 817-948-4503 today. Our fence installation professionals are happy to help you decide which fence is best for your budget, your style, and your needs. Installing a Pool Safety Fence Can Save A Life. Installing a pool is a huge investment in your home, so adding a fence to that may seem like a bit much. However, to own a pool without a pool safety fence is a very risky thing. As the name implies, a pool safety fence installation is designed to make your pool safer. The CDC states that for children between the ages of 1 and 4, drowning is the number one cause of unintentional death. They also state that four-sided fences around the pool reduce the chance of drowning by 83%. Children have a habit of sneaking away, and if pools without a fence can be a huge danger, as well as liability, even if you don’t have children of your own. A safety fence will protect children who don’t know any better. Beyond safety, these fences can add a sense of luxury to your pool, as well as add to your property value! Make Your Pool A Safer Place Today! If you are interested in adding a pool safety fence to your home, speak with one of our professionals today to explore your options. 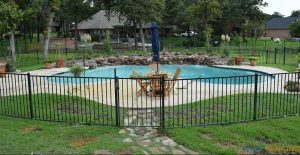 A Ware Fencing, we offer a variety of home fencing options, but one of the most important is our pool safety fence installations in Crowley and Fort Worth, TX and the surrounding areas. Make your home and pool a safer place today, with help from our fencing experts. Besides fence installations, we also offer fence repairs and replacements as well. Call us at 817-948-4503 to get started. Updated on September 20, 2018 at 9:07 am by Ware Fencing.